When I make fruitcake I use a variety of chopped up, dried fruit rather than the premixed jar fruit cake mix. But I have to admit, I was curious to try the jewel-toned fruit mix and couldn’t resist snagging a jar on my last shopping trip. 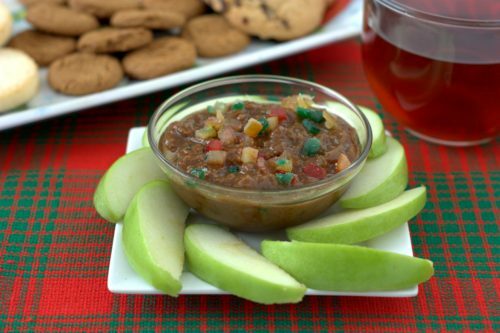 Since I already had a lot of desserts in the works for Thanksgiving, I wanted to work it into something easy so why not make Fruitcake Cookie Butter? If you have never tried cookie butter before you are missing out – think your favorite cookie that has now become spreadable like peanut butter. YUM. You can actually use any crunchy cookie to make cookie butter, but for a fruitcake version I thought gingersnaps would be the best way to simulate the spicy bread. The gingersnaps are finely ground and then mixed with oil, water, and powdered sugar to make the base. 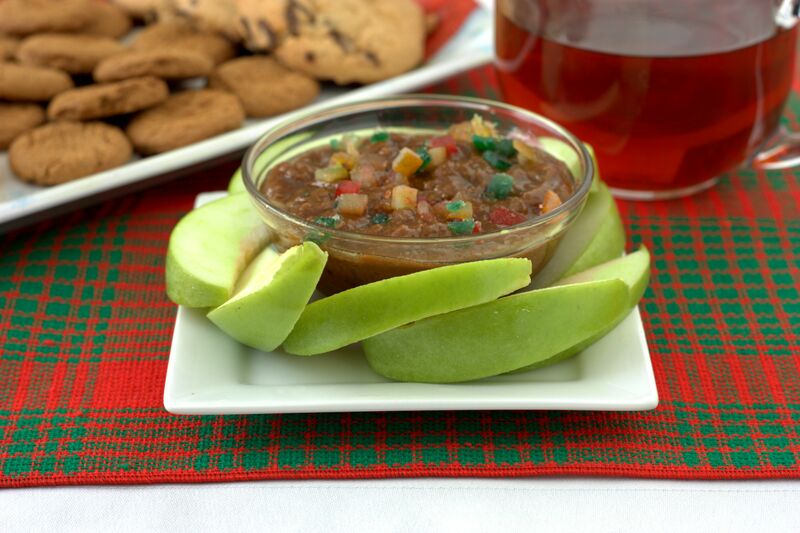 To transform it into Fruitcake Cookie Butter, a generous amount of fruit mix and a bit of imitation rum extract are stirred into the butter. The only step left is to dig in. 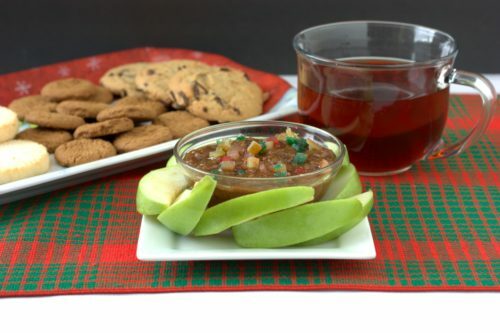 I used wedges of granny smith apples to serve up the cookie butter. 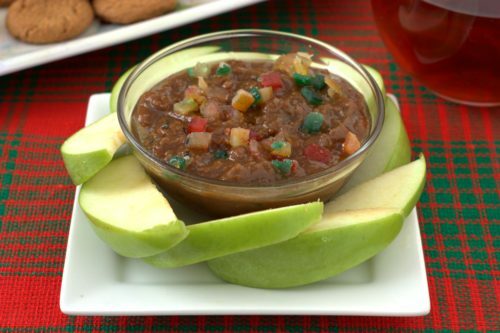 Now you have a way to enjoy fruitcake even if you don’t have time to make a traditional loaf! Using a food processor, crush the cookies until they are finely ground. Keeping the food processor running, add the oil and water slowly until a spreadable syrup forms. Gently stir in the powdered sugar until it is incorporated, then stir in the fruit and the rum extract. Refrigerate until ready to serve.